EMPIRE STRIKES BACK, 1979. Original NSS GWTW style A 1 Sheet (27″ x 41″) movie theater poster authentication and poster for sale here. ESB is starring Mark Hamill, Harrison Ford, Carrie Fisher, director Irvin Kershner and producer George Lucas. The second movie made in the Star Wars franchise is Episode V (5). This Style A is nicknamed the “GWTW” version because of Han and Leia’s romatic pose very similar to the Gone With the Wind poster and the epic pose between Clark Gable and Vivien Leigh. This beautiful artwork was done by Roger Kastel. To authenticate this movie poster be aware of several fakes and forgeries: (1) zig-zag (zig zag is written on the bottom margin), (2) gloss level and weight ( a forgery is very glossy and the paper is much thicker), (3) the poster doesnt measure 27 x 41″, (4) GAU logo on the bottom margin is missing. For more tips <Click Here>. When performing your own authentication, know there are in fact two original versions of this poster. There is the version with NSS information on the bottom margin and there is the studio version without the NSS info. This poster is the original NSS version. 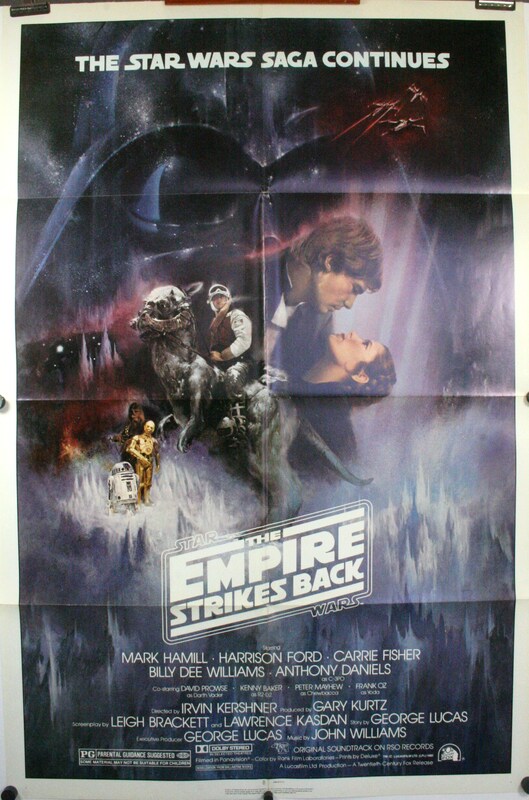 This original 1 sheet movie poster for Empire Strikes back is for sale and in fine to very fine condition. It does however have some minor imperfections to note; there is slight wear along the fold lines and slightly accentuated wear along the cross folds. Outside of this the poster is wonderful.